His guided missiles bring down the house. With just six days until the game arrives on iOS and Android, advertising for Rovio's Angry Birds: Star Wars 2 is at a fever pitch. Today, the company released a new trailer showing the latest addition to the game - bounty hunter Jango Fett. Well, a pig version of him, anyway. Jango is quite an effective character in the game. After launching him, you can fire guided missiles at a particular point in the stage. Time it just right to bring everything down. 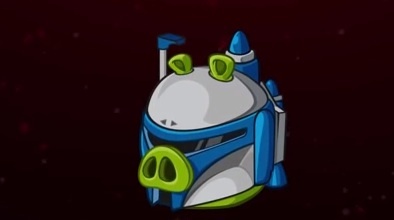 Angry Birds: Star Wars 2 releases September 18th.